All brands are in constant search of the perfect images for their products, which is often not easy to find immediately. Be it clothing, lingerie, jewelry, watches, any type of product has to appear in the right light, the right spot, the right form. For most e-commerce businesses, catalog sites, magazines, advertisements or different visual presentations, mannequins are used when photographing the items in order to create a 3D effect that offers a full view and perspective of the garment. But in the final version of the image, those mannequins must be removed so that prospective clients can only see the product in a “ghostly” shape, meaning exactly the full clothing, back, and front, without mannequins. That is an extremely interesting Photoshop job that our editing specialists here at Pic Buz can do in a very professional and efficient way. To remove the background of a Product & Joint the neck and take extra care of edges as well. To remove the background, take the neck from other picture & filled the neck. To remove the background from a product, Cut out the dull and filled the neck joint. Also called “the invisible mannequin” effect and in close connection with the neck joint service, this technique is very useful in making your product more eye-catching, more appealing, and therefore with more chances of being purchased by your clients. In terms of cost-effectiveness, it is definitely smarter and more efficient to invest in editing services rather than buying transparent mannequins, for instance, or using photos with clothes falling from a hanger. From an editor’s point of view, knowing how to create the ghost mannequin effect is a proficiency test for Photoshop users. It is a manual work that implies a lot of attention and dexterity, and our team is more than prepared to do a great job with your images. Competency is a key feature of our business. How do we create the invisible mannequin? It’s simple. All we require from you are photos of the items you want to upload on your sites or print in your magazines. You’ll need to take both the picture of the mannequin in front angle, as well as pictures of the back angles and neck. These shots will allow us to include the inner parts of the clothing and recreate the complete structure of the neck. Of course, all photos need to be of high quality, so that we can do our job in a professional way. This process of capturing the right angles at an exhaustive level is quite essential for having the full dimension of your product. What we do with these photos isn’t magic, but it’s proficient. We know a lot of Photoshop tips, we are fast in delivering, and we love to make everything look natural, authentic and well-proportioned, with an in-depth overview. After all, the invisible mannequin is all about having the complete image of the product, with a professional touch. 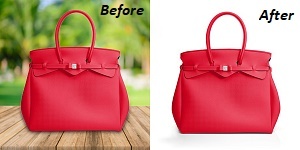 So, once we have done your product clipping path and removed the unnecessary background and other details, we then “polish” the product mask to its edges, we double check all the alignments and then we proceed to the neck joint technique where we use precisely the photos from different angles. We fix any errors in matching and, in the end, we apply an important ingredient, which is shadowing the neck area. All these steps are done very fast and very skillful. You can completely trust our services and contact us for this kind of effects or any other professional editing jobs.